Late last year, we ran an article about Seiko’s expected reissue of the 6309-7040–a beloved dive watch the brand produced throughout the ’70s and ’80s. That article garnered a lot of interest from our readers and online watchdom in general, and for good reason. The 6309 is undeniably a great watch–one of my personal favorites from Seiko’s historical catalog–and amongst Seiko diehards it remains a must-have. As far as vintage divers are concerned, they’re also relatively affordable and offer great bang-for-your-buck value. The 6309 was manufactured by Seiko for approximately 12 years–from 1976 to 1988–so one could argue that they’re not rare watches. And for a long time, that was certainly true. Finding a well-priced original 6309 was no challenge, but in recent years that has become less of a reality. There are a lot of Franken-6309s floating around on Ebay and on forums with aftermarket parts–some of them good, and some not so good–and NOS replacement parts like handsets and bezel inserts are getting harder to source. Seiko is not a brand to rest on its laurels. While its Swiss counterparts eagerly turn to the past for inspiration for the present, Seiko has been more cautious in the playing the heritage game. But the last couple of years Seiko has been slowly releasing watches inspired by classic pieces from its archives with varied results. I would have never expected they’d do the same with the 6309, but I am so glad they did. This reissue, dubbed the PROSPEX SRP77x collection, is for anyone who loves the look and feel of the 6309, but would rather not delve into the murky waters of vintage watches. It’s also great for someone who may already own a 6309 and would rather use a similar watch as a beater than risk ruining the original. The SRP77x collection is not a limited release, intended to be a mainstay in their current catalog that rightfully falls between the affordable 007 and the beloved SUMO, the latter also in the PROSPEX line. There are currently four variants slated for release in early 2016. Today, we’re going to take a look at the SRP777 (black on a silicone strap) and the SRP775 (gilt dial on a metal bracelet)–both of which are now available through several third-party online ADs. The other two–the SRP773 (blue dial and bezel on a bracelet) and the SRP779 (black dial and pepsi bezel on silicone)–are not far behind. At an MSRP of $475, I think they’re well positioned within Seiko’s PROSPEX line and a great bargain for anyone in the market for a solid diver under $500. Let’s take a closer look. The cushion shaped case comes in at 44.3mm wide with a lug-to-lug height of approximately 48mm. The watch is 14mm thick, and it has a lug width of 22mm. It’s a large watch, for sure, but it’s not oversized. As someone who has a preference for smaller watches, I can’t help but love the proportions here. The size feels purposeful and not bloated in the way so many modern divers are. The SRP77x isn’t some unrefined hockey puck. The case is rounded towards the bottom and the crown is recessed, so nothing digs into the wrist. If anything, the watch floats on the wrist. Overall, it’s just an incredibly well executed watch that uses smart design to take full advantage of its size. The finishing features circular brushing on the top, which then transitions to a highly reflective polished finish as it moves towards the bottom of the case. There is a sharp delineation between the two surfaces that suggests quality manufacturing. At 4 o’clock you have the oversized screw down crown offering 200m of water resistance (the case is also ISO-rated to comply with ISO 6245 standards for diving watches). As previously mentioned, the crown is partially recessed into the case. Now, I usually don’t love recessed crowns. The crown on my Squale 50 Atmos, for example, is a huge pain to engage and operate. Luckily, that’s not a problem here. The case leaves open a large graspable surface so that operating the crown is easy. That said, the action on the crown does leave something to be desired. I would say that it is in line with what you get on the 007 and not something a little higher end. On the SRP777 unit, the action is a noticeably gritty and it sometimes catches on the threading. The SRP775, however, is incredibly smooth, so it’s likely a QC issue on Seiko’s part and not necessarily a flaw in the design. One of the biggest improvements to the original design is the inclusion of drilled lugs on the SRP series. I am a huge fan of drilled lugs. I think most watches, especially sport watches, should have them purely from a functional standpoint, and that’s no exception here. If you’ve ever tried removing Seiko’s fat spring bars from one of their divers, then you know exactly how hard it can be without drilled lugs. Now it’s made easy. The bezel is a 120-click unidirectional diver’s bezel featuring a black aluminum insert and shielded lume pip. The insert is ever-so-slightly textured, mimicking the inserts found on the original. Another nod to the original is the way the insert declines towards the crystal–a feature that gives the top of the watch some dimensionality. 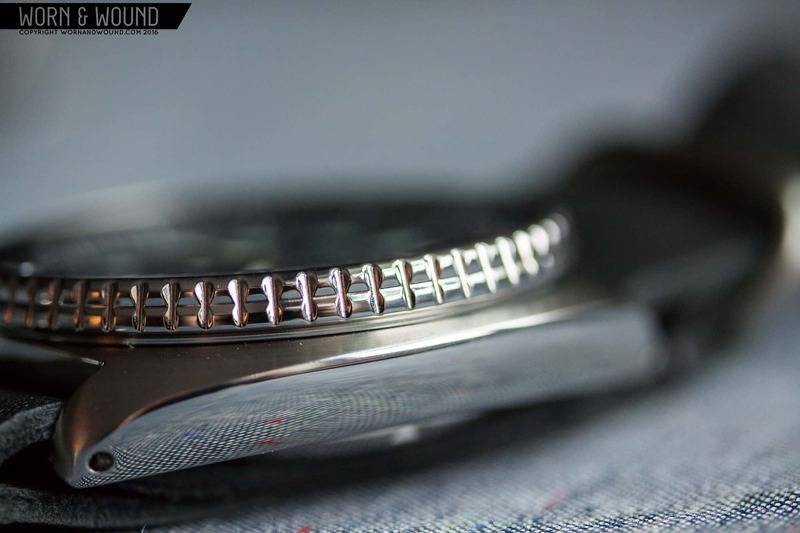 The bezel itself has a two-tiered groove pattern that allows for a tight grip. The bezel action is a bit stiff, but overall solid. There is no wobble or back play, which is rare in this price bracket. Sitting atop of the bezel is Seiko’s proprietary mineral glass, Hardlex. I think Hardlex makes complete sense within the context of this watch and its positioning within the PROSPEX line. Plus, my experience with Hardlex has been nothing but positive, so I have no reservations with its use here. Flipping the watch around you have the screw down stainless steel case back with Seiko’s Tsunami logo dead center and some of the specs along the edge. It’s finished well with light circular brushing, emphasizing the sculptural tsunami. One curious element is that it reads “Air Diver” above the Seiko logo. As we have learned from the comments, this designates that the watch is intended for scuba diving where an air-mixture is suitable. Like the case, the dial is largely a reproduction of the dial on the 6309. And just like the case, it has some features that I would argue are upgrades over the original. Similarities include a day/date function at 3 o’clock seen through a beveled window (an indicator of an original dial on vintage 6309s), the hilted sword separating the two markers at 12 o’clock, and the iconic sword and arrow hands. I would have preferred the seconds hand from the 6309 with the lollipop on the front end rather than the hand from the 007 which has the lollipop as the counterweight. I’ve always found that to be a slightly curious design choice, and while it has no effect on the actual functionality of the watch as a diving tool, I think it looks a tad strange. 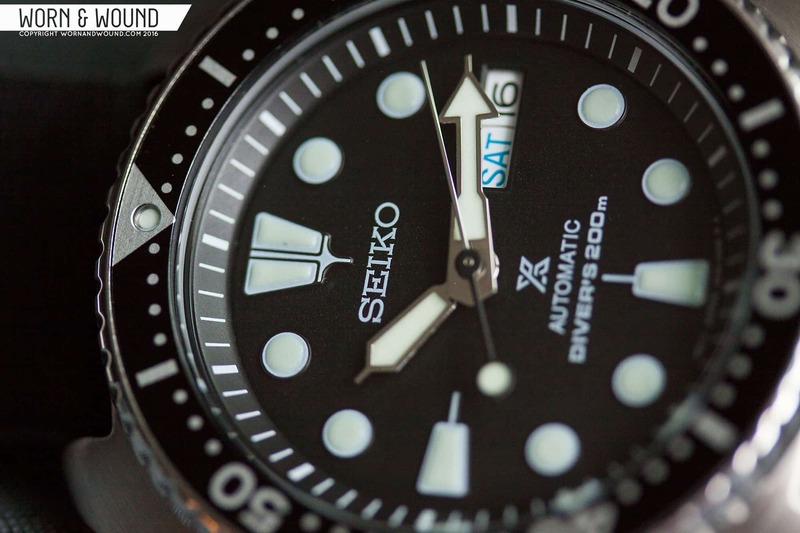 The markers are bold and legible–exactly what you want in a dive watch–and a detail that wasn’t clear from Seiko’s official images is that each marker is surrounded by a very fine metallic border. In the case of the 777, the border is silver. With the 775, it’s gilt which matches the bezel and the hands. The gilt dial is especially great, since it catches the light in a really pleasing way at certain angles. It gives the dial a higher-end feel than what you might have if it were simply printed. All indices and hands are generously filled with Seiko’s Lumi Brite paint. There is a great bubble effect on the markers from the way the lume is applied, which gives the dial some texture and dimensionality. The lume charges quickly, lasts well into the night, and glows like a torch. Unlike the original, the SRP77x series is a bit text heavy. 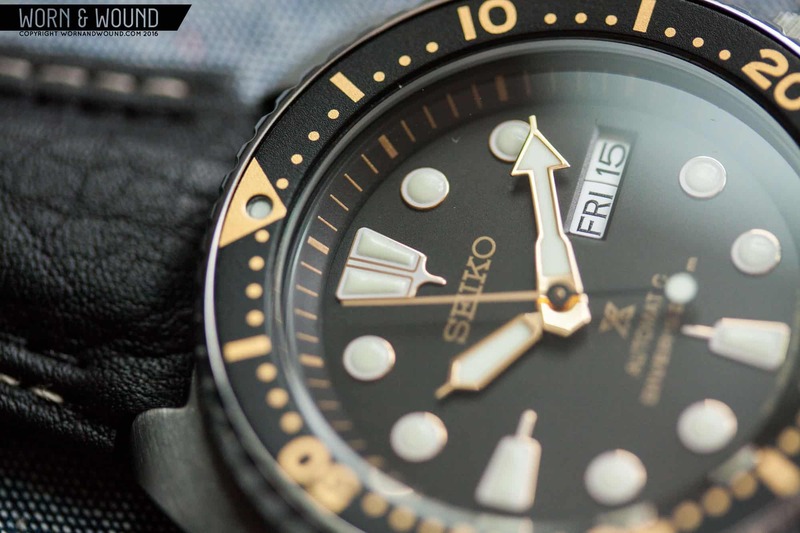 You have the “Seiko” logotype under the 12 o’clock position, and resting above the 6 o’clock spot are three lines of text and branding, starting with the much derided PROSPEX logo (I, for one, like it), “AUTOMATIC”, and “DIVER’S 200m”. Despite this added verbiage, the dial remains well balanced with the Seiko logotype taking up a bit more real estate on the dial of the reissue. The watch is not without its faults. There is a small misalignment problem with the chapter ring, a Seiko QC problem for quite some time now. The misalignment is slight here, a not nearly as bad as I’ve seen on other models. Had I not been aware of the issue beforehand I might not have even looked or noticed. That being said, I’ve read reports from others saying their chapter rings were okay, so there is probably no way of knowing what you’ll get when you order the watch. Personally, it wouldn’t deter me from buying this watch, but I can understand how it could dissuade others. Beating away inside the SRP77x series is the Seiko 4r36 caliber movement. The 4r36 hacks and hand winds, has 25 jewels, a beat rate of 21,600bph, and 41 hours of power reserve. In other words, it’s a solid movement from Seiko–a step above the 7s26 but a notch below the 6r15, which is Seiko’s competitor to ETA’s 2824. Some might bemoan the perceived downgrade, but the 4r36 is a workhorse built up from the ever-reliable 7s26. It can also be adjusted to achieve great accuracy. The main structural difference between the 4r36 and the 6r15 is that the latter has a mainspring and balance spring made from Seiko’s SPRON material, which better handles positional and temperature variance. I haven’t timed either of these watches, but I haven’t noticed any major timekeeping fluctuation that would make me think the movement is underperforming. Plus, if it helped keep the price down then I am more than okay with the use of this caliber. The SRP77x series comes with two strap options–either a metal bracelet or a black silicone strap. The bracelet is 22mm at the end links (solid) and it tapers down to 20mm at the clasp. It has four points for micro-adjustment, a diver’s extension, and the links are connected using a pin-collar retaining system. It’s essentially an oyster style bracelet, though the inner edges of the outer links are polished while the rest of the bracelet is brushed. It’s a good looking bracelet and it feels solid, though the clasp is probably the only weak point, but Seiko isn’t really known for their clasps. I do find that the bracelet adds a significant amount of weight to the watch head, which is already weighty on its own. My personal preference is the OEM silicone strap. The silicone strap is smooth and pliable and much nicer than the z22 rubber straps that come paired with the 007, which I find to be too rigid. The strap also features a new buckle design and a metal keeper, both of which are well finished with polished sides and brushed surfaces. Even though the SRP77x is a dive watch, I find that it pairs well with a wide variety of straps. Naturally, I’ve tried it on a nylon and leather mil strap. I’ve also had it on a Di-Modell pilot’s band, as well as one of our vintage-inspired Model 2 straps in shell cordovan. Admittedly, I’m a desk diver so I have no issue pairing leather with a dive watch. At the end of the day, it’s about what looks good and I think this watch is a bit of a chameleon in that regard. Seiko got this one right. So many brands today rely on their archives for their current releases, and many unfortunately screw it up. Here, Seiko brought back the 6309 the right way, modernizing the build but still keeping the general feel and aesthetic of the original intact. 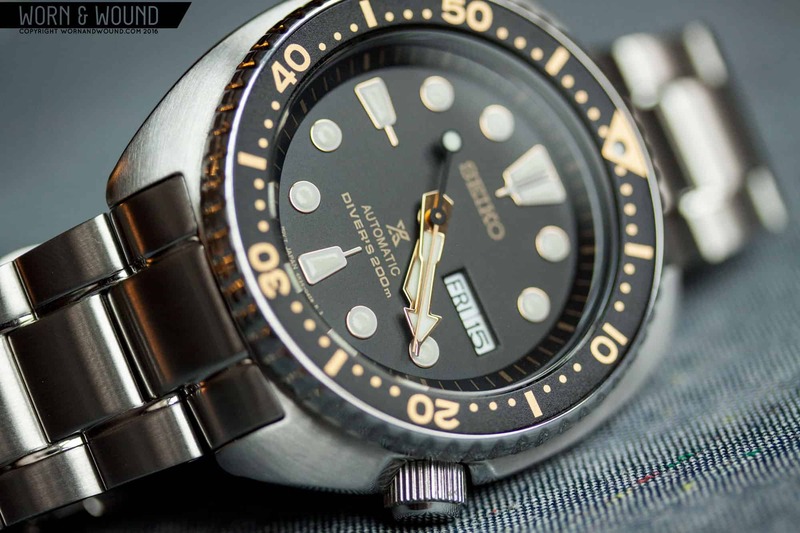 At retail, the Seiko Prospex SRP777 / SRP775 is a great buy, and probably one of the best sub-$500 divers on the market. Heck, it even fares well against most sub-$1000 divers. Not to harp on my 50 Atmos, but I put the two side-by-side and saw little reason to shell out the extra cash for the Squale (except, of course, a preference of design). With a street price that seems to be hovering around the $350 mark, the SRP77x is a no-brainer. For those looking at the 007 as an affordable diver, I would argue for spending more to get the SRP. The look and feel of this series just comes across as being in a class above the 007, and I personally find the aesthetic far more pleasing. All in all, it’s a great release by Seiko, and now I’m left wondering what else they have in store. My main problem with this is simple. I can’t afford one currently, and i want one RIGHT NOW. Also, to my eye, it looks as though on the SRP777 pictured that the chapter ring isn’t misaligned. But that the larger rectangular markers at 6 and 9 are not centered, and are slightly counter-clockwise from where they should be sitting. The ones on the SRP775 aren’t quite as obviously so. It won’t keep me from buying one when I’m able though. “Air diver” on the case back refers to the fact that it’s not made for saturation diving. Thanks for that bit of information! I’m kind of kicking myself now for not realizing that. No worries. Great review by the way! So air diver would be found on any Seiko dive watch without a helium release valve (that feature being specifically for saturation diving)? Helium escape valves are not necessary for saturation diving. If a watch can handle 1000m of pressure then there will be no internal pressure issues. I don’t think any Seiko’s have this valve, they just build them tough e.g. Tunas. That depends on the design. For example, alot of watches have the crystal mounted such that high external pressures (deep water while diving) push it more tightly into it’s mount while internal pressures (high pressure Helium inside the case) will pop the crystal out of the watch. If Seiko don’t use Helium relief valves, then they must design their watches to handle both internal and external pressures (which is probably a better solution to the problem). Seiko doesn’t ‘believe’ in HRVs. They simply design the cases of their deep divers such that the amount of helium allowed into the case during saturation diving is so minimal as to be benign. I think I heard one of their engineers or executives say of HRVs that they are ‘just one more place for a watch to leak’. Or they design their watches to withstand pressure both inside and out – for example mounting the crystal in way which prevents it from popping out when there is high pressure Helium inside the watch and normal pressure air on the outside. The gilt one is fantastic and were it a bit smaller I’d pick it up in a heartbeat. I wonder if Seiko will ever try to make a high quality (such as this) but also small, diving watch. I’m surprised their watches, including GSs, are generally so chunky. As an SKX owner, I don’t see myself actually spending in this 44x14mm behemoth. They wear about the same due to the cushion case of this new model. I tried on one of the original 6309s and the proportions are perfect. Not sure why they’d supersize it to make it modern, specially given that the average asian wrist is not as thick as in other markets. Great review! I can’t wait to pick one up. I have to say $475 is better than what I expected. Great review and I look forward to getting one. 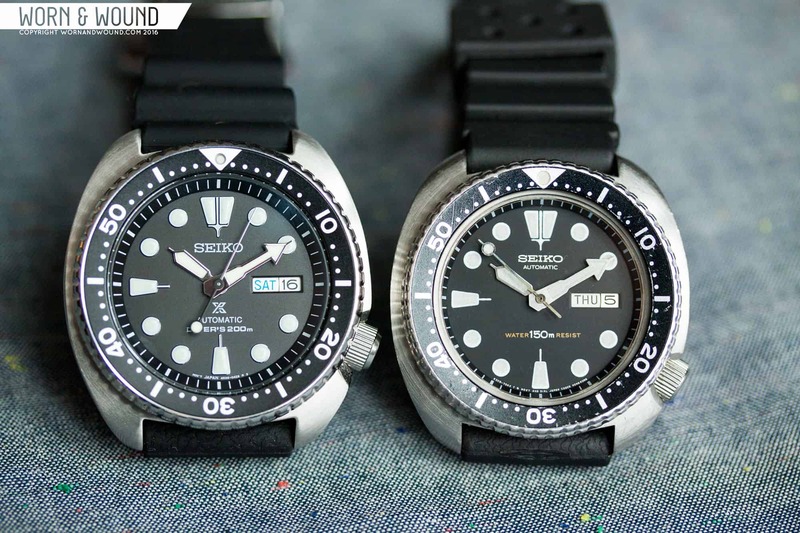 That would make 3 Seiko divers for me, but they make them so darn well I can’t not get one! Such a nice update on the iconic 6309. When I saw the rendered pictures that Prospex logo looked pretty unsightly, however it looks much better in real life in my opinion, I can certainly live with it. Price is very competitive for a brand with so much kudos and heritage in the diving watch scene. I recently bought my first Seiko. I like it, aside from the fact that it has a misaligned chapter ring. As does the 777 shown here (easiest to see at six o’clock). This is a tiny detail, but it’s absolutely maddening once you notice it. It looks like they kept their design true to their roots. This just might be added to my collection as well! which one better for daily office use? Hi there everyone,been wanting to get the SRP777J from an online store but couldn’t help but to notice a different marking of the J model on this watch which reads “movt Japan” and the one from the online store which reads “Made in Japan”,any idea why seiko made them different? *here’s a photo of the “Made in Japan” marking. why has the street price on the srp777 gone up from 370ish to 490? Got my SRP777J model online for $420 in Singapore,it was worth every cent and luv the feel of the new silicone strap…smooth as butter,strongly suggest on getting it,it was a natural choice after my SKX007.